Best Taco Casserole Recipe Ever! Mini Party Subs – Great for Parties! Learn how to make this Unicorn Smoothie Bowl with this easy smoothie bowl recipe using berries and protein-packed greek yogurt! When it comes to kids recipes, sometimes you’ve got to make it fun. Like, really really fun. Sometimes, you’ve got to think like a kid in order to get them to eat the healthy stuff. Even though you know the healthy stuff tastes good. Even though you know they love it, they still want to look at you sideways and say “Really, mom? A smoothie bowl? Do I have to?” They know your tricks, man. But this one? This smoothie bowl recipe is full of color, goodness, and is just plain FUN! I mean, ARE YOU KIDDING ME RIGHT NOW? Look at this smoothie bowl awesomeness. This? This right here is the stuff that little kids dream of. Unicorn deliciousness made of fruit and protein-packed greek yogurt made of WIN! This unicorn smoothie bowl is even easy to make, too! The kids can totally help create their’s! It’s a win-win! With just a few key ingredients, your kids can learn right alongside you how to make a smoothie bowl worth bragging about! No need to separate your frozen fruit, plop ’em all in a bowl to puree together for that gorgeous pinky-purple color! Aren’t they gorgeous? Add your frozen blueberries, strawberries, milk, honey and cinnamon into your blender for a little smoothie blend party. Blend until smooth. I know you’ll be tempted here to have some, but don’t! You’ve got a smoothie bowl recipe to make, this is just the start! Add just a dollop of your Greek yogurt into the smoothie, right smack dab in the center. Use a fork to marble the yogurt into the smoothie. Heck, let the kids get creative here! You know? 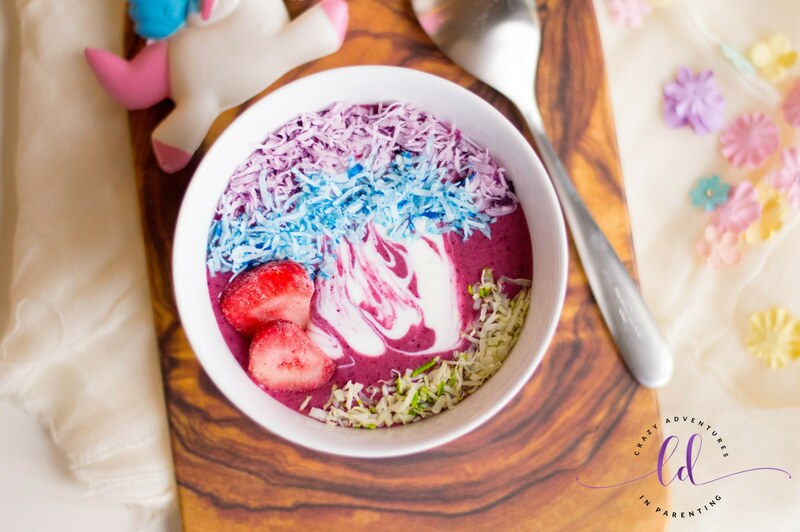 To decorate your unicorn smoothie bowl, break out the food coloring and shredded coconut. For each color you want to use (we used blue, purple, and green since the smoothie bowl was already berry colored), place the shredded coconut into sandwich bags with 1-2 drops in each bag of each color. Shake it, baby! Have your kids shake the colored shredded coconut, make it even more fun for ’em! It isn’t hard to do, either! Once the shredded coconut is well colored in each bag, place it on top of your smoothie bowl. Arrange it in lines, however you (or your kids) would like! Add blueberries, strawberries, milk, honey, and cinnamon in a blender. Blend until smooth and pour into a bowl. Dollop your Greek yogurt into the smoothie and if desired, create a marbled look with a fork or toothpick. Get 3 sandwich bags and fill each one with 2 tbsp of shredded coconut. Add one color of food coloring into each bag and shake until coconut shreds are tinted. Pour over your smoothie bowl and enjoy. Top with fruit, if desired. Tried this recipe?Tag me to show me @crazyadventuresinparenting and/or use #MadeItLikedit to be featured on Pinterest! 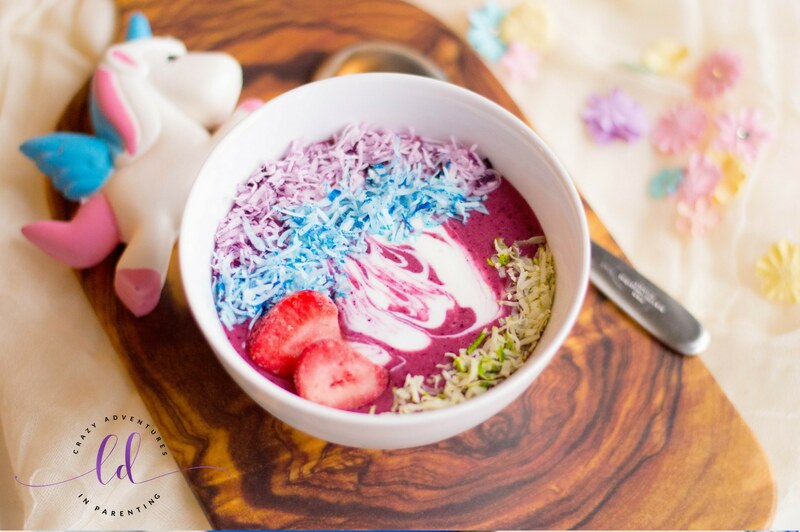 What do you think about this unicorn smoothie bowl recipe? Check out my other smoothie recipes, too! Like this gorgeous Very Berry Smoothie! Hi, I'm Lisa! Welcome to my perfectly imperfect corner of the web where I've chronicled my crazy, fun-filled life as a mom to "eleventy-billion" kids since 2007! Here I share our family-friendly recipes, crafts and creating art, traveling as a big family, reliving my youth endlessly dancing to 90's music, and documenting our adventurous life while sipping coffee and basking in the delicious Colorado sunshine. Welcome to Crazy Adventures in Parenting - the fun-filled, crazy life of Lisa Douglas, a former Army wife raising eleventy-billion kids in the stunning mountains of Colorado. Here she shares humorous parental war-stories, yummy homemade family-friendly recipes, craft tutorials, hilarious family videos, and so much more. Lisa's on a journey to savor every "small" moment, finding the humor and the joy in everything (even diapers and laundry). Copyright © 2007-2019 Crazy Adventures in Parenting · All Rights Reserved · Reproduction in whole or in part without permission is prohibited, so don't steal my stuff and I won't have to ninja kick you in the head lawyer-style, mm'kay?